A mama's heart is many things - fierce, protective, resilient, ever-loving. In my few years of holding the title, I've come to learn a mama's heart is also fragile. It's not constant and it's not crushed just for anything, a mama's heart is tough, strong. Only when we see our kids subject to pain, hurt, rejection does the fragility devour all other qualities and we fight to tap into that resilience, fierceness as we try to stay standing tall. The other day at the park, there was a little girl about Ella's age with her Grandma. She was running from little play structure to little play structure in the "Tot Lot" when she arrived at the one Ella and Archie were playing at. Immediately, Ella went from "Mommy, stand on this" to inching toward this little girl giggling - the universal "You wanna build a snowman?" in toddler girl code. Tim was now at the play structure, I on the bench in the shade, and the little girl ran from the slide to the teeter totter, Ella running after her. When the girl noticed Ella had followed, she stuck out her arms looking as if she was signaling Ella to go away and her Grandma, in an effort to be inclusive, patted her shoulder with what I only could assume was a, "be nice." The Grandma got on the teeter totter with the girl, bounced, and asked Ella if she wanted to get on. Ella ran over to the bench, "Mommy, I need to get on the seat." Fragile, oh so fragile, I said, "Okay, sweetie. Run and ask Daddy. He'll put you on." In these moments, Tim is the strong one. Ella did, but by the time they got over there, the girl ran away. Ella watched her get on a swing and continued to play with Archie. Ella is only 3, she is tiny, but her heart is the size of Everest. She's shy around adults, but she isn't the least bit shy around kids her size. She goes out of her way to make a friend and plays with anyone who shares the same taste in slides. 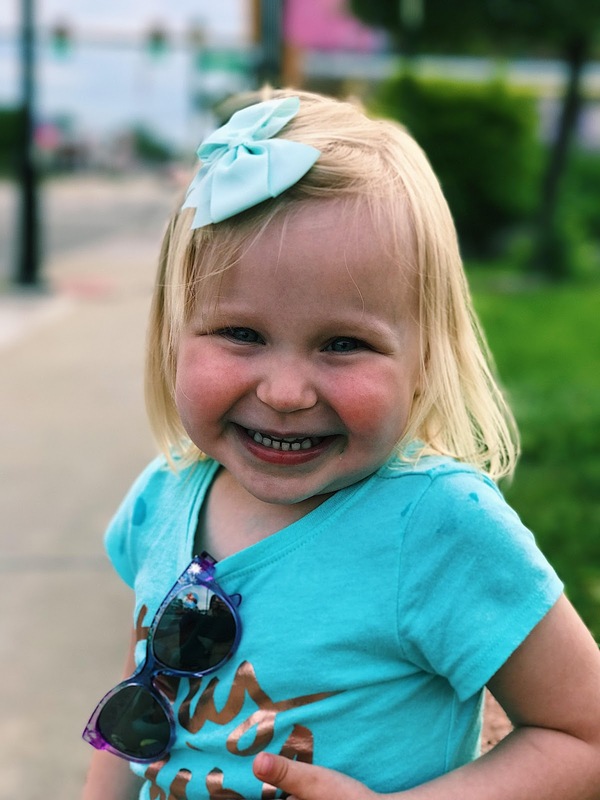 These are qualities I'm in awe of and that I love to see in my daughter, but they are qualities that can result in a little girl saying, "go away" or "I don't want to play with you." And while, yes, they're silly 3-year-olds, witnessing that sort of rejection is what breaks my fierce, protective, resilient mama heart into a thousand little pieces. I know, I know Ella is just 3. Some might even be laughing as they read this thinking, oh just wait. She'll fail, she'll fall, she'll face 300 things that hurt. I'm not old and gray but I'm not naive to life; these realities won't make facing any amount of hurt Ella may endure any easier. Tonight I watched 2 little girls on a tire swing yell, "Get away from us! Leave us alone!" to a littler boy who was simply watching them have their fun. My mama heart immediately broke into a thousand little pieces and I thought, "should I say something?" Neither parent was around, the girls were wanting their sister time and the boy wanted his adventure boy time. There wasn't name calling or bullying, so there really wasn't an urgent need to step in. But as I continued to swing next to Ella I couldn't help but think about my kids being on the line where the little boy stood, or across from it where the little girls sat on the swing. How would they handle that rejection? Would they ever willingly and boldly reject someone else? My tired parenting brain was already fried from the hectic day, so I pressed "pause" on the thought and watched my 2-year-old learn how to pump on the big girl swing. And then, I plopped my 2 babies on the grass and covered their eyes with Target sunglasses in an effort to get a celebratory Archie's-nine-months-old-today photo. As I snapped the picture, I reveled in the sight before me and prayed for the grace to raise each of them as the kid who walks up to the little boy and says, "wanna play?" Thanks be to God, Ella is that kid who goes to others and extends an invitation to play, boldly and without fear. My new prayer is to be granted the grace to accept whatever lies on the other side of the invitation, that one "I don't want to play with you" won't shatter her boldness, her kindness, her confidence, and that I'll be able to walk Ella through come what may. In the meantime, I am learning from her to be kind, to extend an invitation, to smile.